Ding Fang is one of the leading painters in China today. 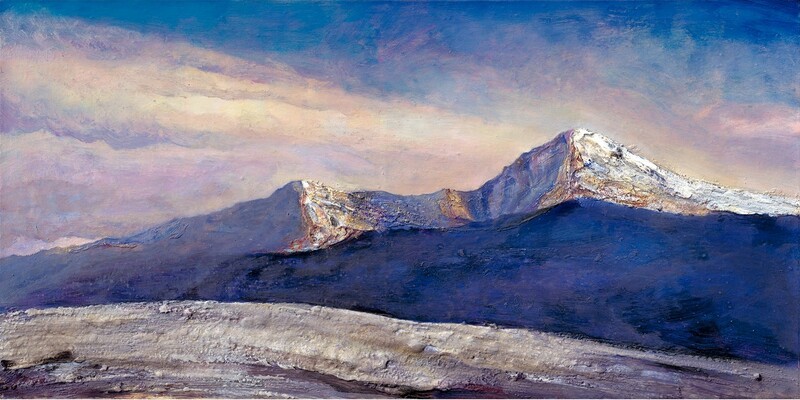 Mountain paintings are prominent in his work, recalling his ancient predecessors, though in Ding’s work no lines of poetry appear beside his images. Yet to his work we may well apply the saying of the Roman poet Horace in his Ars Poetica: ‘ut pictura poesis’, as with poetry, so with painting. The invisible poetry with which Ding’s paintings commune seems to be traditional, yet it is evocative also of poetry from another culture. For the Hebrew poets of the Psalms and Isaiah, ­Rock was a metaphor for God (e.g. Dt. 32:4; Ps. 71; Isa. 32:2) and the mountains a place of communion with God. The goal of the ancient philosophers of the Dao (‘The Way’) was not so divergent from the Hebrew poets, for they sought to be in communion with the spirits of the mountains in order to bring peace to the people. If it is a universal truth that ‘the heart of man ascends,’ we should expect to find symbolic visual language for it in various strains of philosophical art and poetry. Among these, as many have observed, one stream of thought in China which in many respects bears harmonious comparison with Daoism is Christianity. In the biblical religions mountains are likewise places of transformative spiritual encounter. We may think of Mount Sinai, Mount Pisgah, Mount Tabor and Mount Zion in the Hebrew Old Testament, or Mount Carmel, the Mount of Olives, the unnamed location of the Sermon on the Mount and the Mountain of the Transfiguration in the Greek New Testament as examples to put alongside Mounts Sung, Hua, T’ai, Hung, Ho and other Taoist refuges. That Ding Fang may have all of these symbolic sources in mind is hinted at in the large symbolic angel in ‘Angel of the Fortress’ from his earlier volume of paintings, Metalandscape, but it is nowhere more magnificently realized than in his painting no.112, ‘The Kingdom of Heaven in the Morning’, a work of breath-taking beauty in which only the mountains speak. The mountains Ding surveys are barren of vegetation, yet tantalizingly suffused with light and colour. Rather than the softness we associate with traditional ink and brush, we feel almost palpably the course texturing of ageless rock. The counter-play of colour and light lifts up the viewer to hope and expectation. 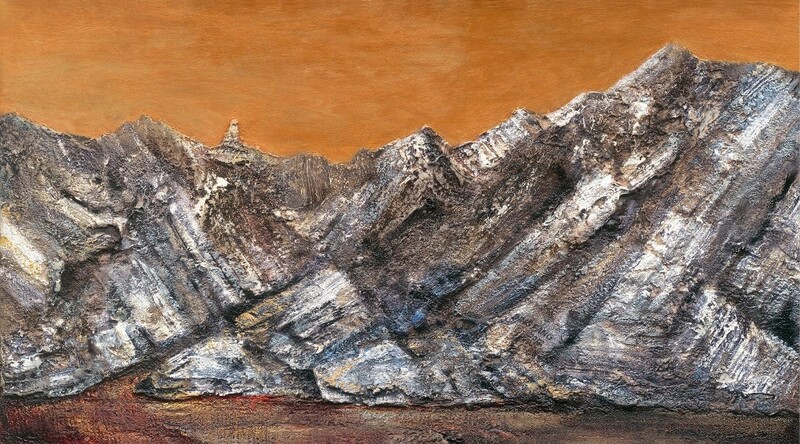 These mountains have majesty, their projected presence is formidable, yet Ding’s paintings almost magically invite intimacy, urging us to move in closer. When we do, we may even have fleeting illusions of a human presence. In the second painting what looks like a tiny white-robed figure stands on the barren ridge, in others what might be small figures move toward a great cleft in the rock. This may remind us of an ink painting from more than a millennium ago, The Inhabitants of Lung-su, by Tung Yüan, in which one must peer closely to discern the faint presence of tiny human figures under the shadow of the vast mountain landscape. What, we may ask, is the artist suggesting? It seems more than possible that, like Chinese artists over the centuries, Ding Fang looks up to the hills, the mountains from whence comes his sense of enduring trustworthiness. Yet he does so also with Christian eyes. Human beings flourish, he seems to be saying, when they live close to the Rock. This figuration is powerfully expressed in his most recent work through a frisson not only of modern and traditional techniques – ink, brush and acrylic pigments together – but also of spiritual resources both Chinese and West Asian, Taoist and Christian. That juxtaposition is a remarkable achievement. Those who study these paintings will come to appreciate that Ding Fang’s stunning sense of space, texture and colour has raised his art to universal appeal, compelling in grace and beauty. Ding Fang: The Kingdom of Heaven in the Morning, 60 x 120 cm, synthetic materials (nepheline glue, plasticized paste, lithopone powder, linen, AVC emulsion, propylene) and paint on canvas. Ding Fang: Untitled, 60 x 120cm, synthetic materials (nepheline glue, plasticized paste, lithopone powder, linen, AVC emulsion, propylene) and paint on canvas. Ding Fang (1956) is Deputy Director of the Department of Studio Art at RenminUniversity, Beijing and he has served as Executive Editor for China Art News, published by the Chinese National Academy of the Arts (1988-1990). His work has been featured in major exhibits in the leading galleries of China. David Lyle Jeffrey is Distinguished Professor of Literature and the Humanities at Baylor University and Guest Professor of Peking University. His most recent publications have featured the painting of Marc Chagall, and he is working on the book Arts of the Holy, tracing the concepts of beauty and holiness from the Bible to modernity.